The DBTools QueryIT is an excellent application for designing and creating queries. It was designed to allow users with no knowledge of database administration, create queries accessing data in their databases and export the results into other formats. The clean and improved User Interface can be easily mastered in a few minutes using the application. Query Editor: which is where all SQL and DDL commands can be manually typed and executed. With support for binary data (and image previewing) and memo (large text) fields, this Editor can show multiple results in tabs format. Table Datasheet: is a very useful designer to edit table's data. The designer is also capable of constructing comples queries, allowing the programmer to add one or more tables, create relationships between them, previewing sample data from selected tables. Also this feature allows to insert and export binary data from tables, when in editing mode. If you are a DBTools Manager Professional user you can benefit from that. 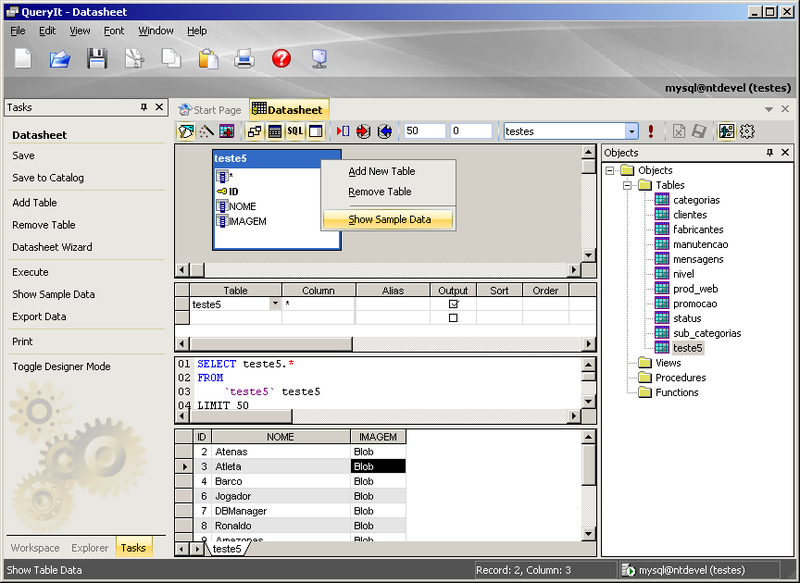 QueryIT is capable of accessing database connections and queries from DBManager's catalog. If you have the Workgroup Server installed in your network, QueryIT can also connect to the server and share information among a group of users. See that this requires a licensed copy of DBTools Manager Professional.